The future of America's central bank leader is up in the air, and President Donald Trump can decide her fate. 1. 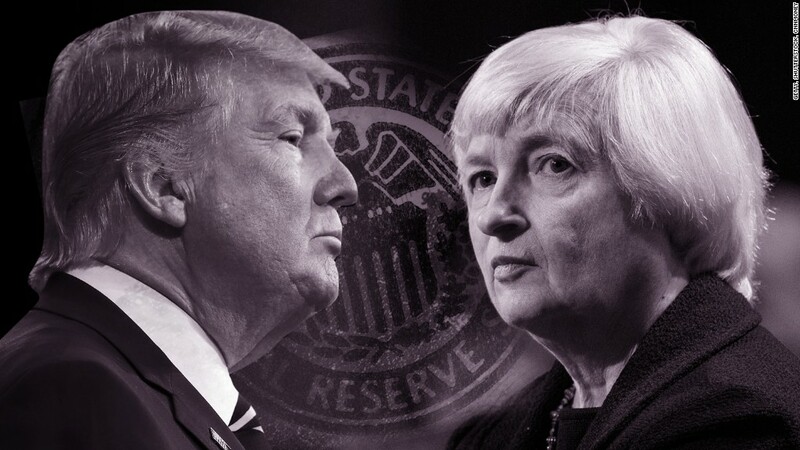 Will Trump reappoint Yellen, an Obama nominee and defender of regulations, to another term or choose someone else? 2. Does Yellen even want to stay on for a second term? Her four-year term expires in February, and Trump has both criticized and complimented her. Traditionally, a president makes a nomination for Fed Chair in the fall in order for the Senate to hold confirmation hearings. Experts aren't convinced Trump will nominate Yellen. But they are more confident that Yellen, who has spent much of her career at the Fed, would accept a second term. "I think there's about a one-in-three chance she stays." says David Wessel, a senior fellow at the Brookings Institution. "I think if the president asked her to stay on, she would say yes." Trump finds himself in a unique position to leave a lasting mark on the world's most powerful central bank. Fed governors serve 14-year terms and Trump has come into office when several are leaving or their terms are expiring. In addition to deciding whether to renominate Yellen,Trump can nominate four of the seven other members of the Board of Governors based in Washington. "This is a really big deal," says Gus Faucher, senior economist at PNC Financial. "This is a huge opportunity for the president to put his stamp on what he wants monetary policy to be." Because Trump likes to make his mark, Faucher argues that Trump is unlikely to renominate Yellen. Yellen and Trump diverge on a key area: financial reform. Yellen staunchly defends the reforms enacted after the financial crisis in 2008. Trump wants to tear them up as a part of a broader rollback on federal regulations. Trump looked poised to nominate one of his top economic advisers, Gary Cohn, as the new Fed chair. But they had a falling out over Trump's response to a white supremacist protest in Charlottesville, Virginia and Cohn is no longer seen as a top contender. Other names being floated: Glenn Hubbard, dean of Columbia University's business school; John Taylor, a professor at Stanford University; Kevin Warsh, a former Fed governor; and Neel Kashkari, the president of the Minneapolis Fed who Wessel describes as a "dark horse." But one of Yellen's friends and former colleagues at the University of California, Berkeley, doubts Trump is giving the nomination much thought. He says Trump could change his mind on a new Fed Chair based on the day's news. "I'm not sure he has any coherent thoughts on the matter," says Andrew Rose, an economics professor at Berkeley. "Even if he had any coherent thoughts on the matter, he might change them in the next 45 minutes." If Trump doesn't give Yellen another chance, her legacy is already cemented, Rose says. "She'll be viewed very successfully," Rose argues. But undoubtedly, he adds: "She will retire and be very, very happy."